Among our Eatin’ O’ The Green recipes for St. Patrick’s Day, this warm spinach dish is very popular. 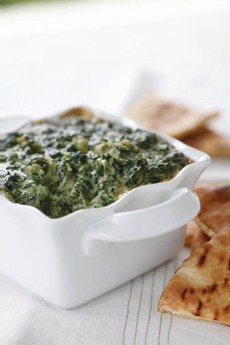 Who doesn’t love a spinach dip, with its glimmer of healthful green spinach blended into a creamy (and not so healthful) base? This recipe, from Vermont Creamery,is made even richer with mascarpone. It’s delicious as a kick-back snack with Irish beer; or with wine and savory cocktails like the Martini. Warm and creamy, it’s Popeye’s favorite dip. Photo courtesy Vermont Creamery. 2. COOK the onion with olive oil in a large sauté pan over medium heat, until translucent. 3. ADD frozen spinach and heat until spinach is hot but still green. Add mascarpone, salt, pepper, cayenne, Parmesan cheese and stir. Pour the mixture into a small casserole or baking dish. 4. BAKE for 30 minutes until bubbling around the edges. Serve warm with pita chips or a sliced baguette. Or add a note of healthfulness with raw veggies (crudités).